There was a surprise award for Rhys Marshall at the end of the Europa League second leg tie in Belarus last Thursday night. At the final whistle the highly rated Glenavon defender was nominated best player of the visiting team by hosts Shakhytor Soligorsk. “I was not expecting it,” said a surprised Rhys. You don’t expect the home team to give awards to the away team. 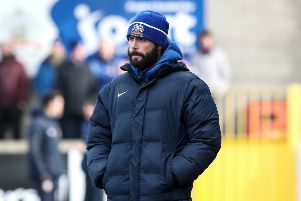 I was making my way off the pitch when a guy come up to me and said I had been voted the Glenavon player of the match and they presented me with a gift. “It was nice to know my performance was recognised. To be honest, it was really tough out there. The heat was tough on all of us. “I felt we gave a good account of ourselves. They certainly deserved to go through over the two legs but we made them work for it. They got a bit of luck with the first goal early on but after that we more than matched them and they didn’t get the second until midway through the second half. “It was a great experience and the trip itself went smoothly and we were treated well by our hosts although nothing beats home,” added Rhys.